perhapablog... and other ramblings: best of the blog: it's superman! the lost week...and apologies to adam! song of the scarlet spider...! best of the blog: it's superman! best of the blog: roswell! 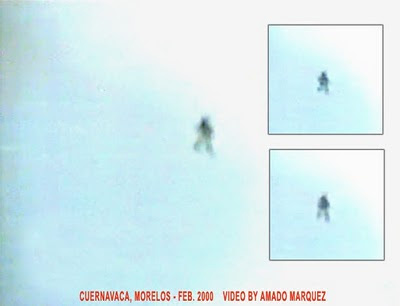 Almost 20 villagers, from Gemeni, Mehedinti county, claim the UFO was wearing a shiny blue suit, just like Superman's. Police officers took written statements from all of the witnesses and say they described the figure in the same way. Local policeman Ion Anuta said: "We talked to people of different ages who are all reliable citizens in our village. "They all said they saw this strange creature who flew over their houses in his shiny blue costume. We'll just have to see what happens next." Villager Constantin Toader, 41, said: "He looked like Superman and was flying slowly at about 100 yards from the ground in a standing position. He didn't make any smoke or sound. Just cruising around." karl said he felt the whole story had a kinda mothman feel to it. i'm down with that, but--and maybe it's just cause of the grainy photos of something floating in the sky--i'm getting a real m.night shyamalan "signs" vibe from it. like maybe these guys are gonna start showing up over every major city soon and then begin the invasion. i'm betting on a balloon. it's a great idea--i know I'D do it. for those of you keen on following the wacky adventures of our pals, brick and tiger from oneshot, here's a letter that matt sent me the other day announcing the debut of their latest episode on youtube! check it out! Hello everyone! We decided to release Brick and Tiger Vs. The Confederate Army on youtube today! I know that many of you have seen it already, but I thought you might like the links anyways. If there are family and friends you want to send it to, that is great! Also, I would not be offended (and in-fact, would be grateful) if you wanted to post the links or at least the first link on your facebook/twitter/whatever today. Thanks for all the support. We start rolling on the next Brick and Tiger here soon! Thanks again. also, who's watching lost...? i was complaining last week that, with but five episodes left, they weren't really doing any "building" of plot or suspense or urgency...but after watching last week's episode and last night's...!! wow! someone help me back from the edge of my seat! this show is going out AWESOME!!! I'm still watching "Lost" and, while I'm not quite sure where they are going, I'm sure am enjoying the ride.